When you are learning to drive, it can seem like there is a lot of information to take in. Even when you pass your test, it’s easy to get confused at times. The most experienced of drivers make mistakes from time to time, so you are not alone! However, it is always best to stick to some simple safety rules, and follow best practice wherever possible. 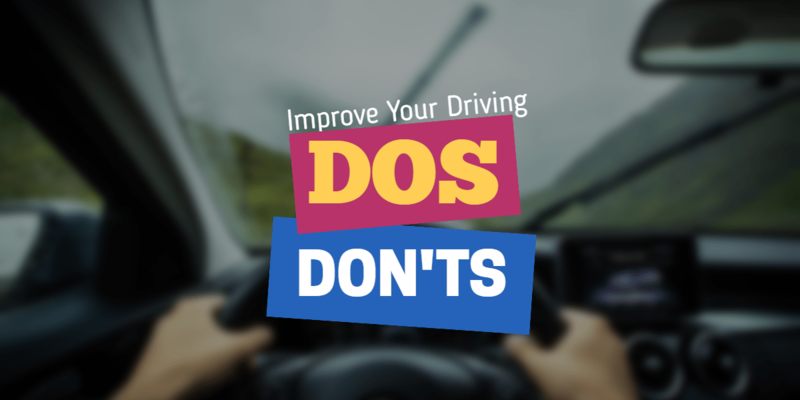 These driving dos and don’ts will help you grow your confidence on the road, and improve your driving skill. Driving is stressful, especially when you are new to it. Other drivers might not follow the rules correctly, and this can be unnerving when you are still learning. If another driver cuts you up, drives too close, or fails to let you pass, try not to get angry or upset. This can affect your own concentration. Focus on your own car, stay safe and avoid hazards, and above all, try to enjoy the driving experience. We are used to being connected by our mobiles at every minute of the day, and it can be tempting to just glance at your phone when a call or text comes in. You should never use your phone, or any other device, while you are driving. It is also against the law for anyone supervising a learner driver to use their mobile. This may seem like an obvious point, but it really is important – for your safety, and for everyone else on the road. You already know not to get behind the wheel after drinking – but did you know that you can remain over the limit up to 24 hours after you drink alcohol? If you have a night out planned, and a driving lesson the next day, you should reschedule it. Avoid driving the morning after drinking, and give your body time to clear. If you are still learning, it is a legal requirement to display red learner plates on the front and back of the car whenever you are behind the wheel. These alert other drivers to your learner status, and warn them to show a little patience and care. They also give the authorities notice that any mistakes you make on the road are the result of your learning. Once you have passed, green plates are optional but highly recommended. They ensure other drivers retain a level of patience while you get used to driving on your own – and they are a symbol of the hard work you put into passing. Wear them with pride! Safety checks should include the oil and water levels, the tyre condition, and the functional status of lights, wipers and other electronic parts. Taking five or ten minutes to check the car is working correctly before you drive will reduce the chance of an accident. It also helps you get familiar with your car, and how it works. It is important to pay attention to the area you are driving in. If you learned to drive in an urban area, you may find country driving unfamiliar, and you should take special care to avoid wildlife and livestock, or to take winding country lanes slowly. If you are more familiar with country roads, the city centre can be equally confusing – navigating busy highways and complicated ring roads can be tricky for anyone, especially a beginner or new driver. Plan your route before you drive and take special care when encountering somewhere new.